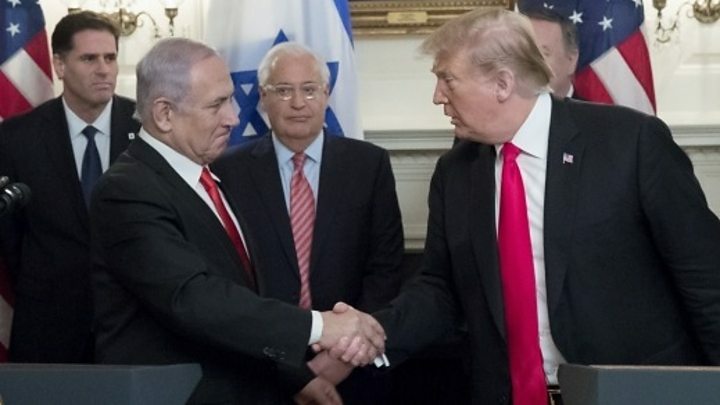 President Donald Trump has officially recognised Israeli sovereignty over the occupied Golan Heights, seized from Syria in 1967, in a move hailed as “historic” by Israel’s prime minister. Benjamin Netanyahu, who faces an election next month, was by Mr Trump’s side as he signed the proclamation. A spokesman for United Nations Secretary-General Antonio Guterres said on Monday he was “clear that the status of Golan has not changed”. For decades, Washington took the same line as the UN, but last week Mr Trump announced his plan to overturn decades of US policy in a tweet. In response, Syria has vowed to recover the area “through all available means”. But Mr Netanyahu told reporters gathered in Washington on Monday that Israel “shall never give it up”. “Your proclamation comes at a time when Golan is more important than ever for our security,” he said, citing threats from Iranian forces in Syria. It is, he added, “a two-fold act of historic justice”. “Israel won the Golan Heights in a just war of self-defence and the Jewish people’s roots in the Golan go back thousands of years,” Mr Netanyahu said. However, there is little sign any other countries will be following in US footsteps, which a Syrian foreign ministry source described as a “humiliating blow to the international community”, according to the state-run news agency Sana. Russia – which has been providing military support to President Bashar al-Assad in the Syrian conflict – warned the decree “could drive a new wave of tensions in the Middle East region”. Meanwhile, Turkey – which has been supporting the Syrian opposition – said it was “impossible” to accept the US decree, adding it planned to take action against it at the UN.